Back in the day—way back when I was cooking my way through Luther Theological Seminary, the Seminary President hosted a Christmas Dinner for faculty and staff. The Food Service Director at that time gathered her motley kitchen crew—made up of tired seminary students and tired spouses of tired seminary students—to prepare the feast. With recipes in hand, we were deployed in every direction in the small kitchen that is now the offices for the Children Youth and Family staff. In my hand was a tattered recipe for Beer Cheese Soup. I was terrified by the reminder that the beer cheese was the president’s personal request. But at the same time I was strangely warmed at the thought of all that beer and all that cheese together on one big happy soup pot. That recipe was simply—from the ground up, butter, carrots, onions, flour, milk, cream, chicken broth, beer and a lot of cheese; pretty simple when you come right down to it. The recipe that follows, which I’ve adapted slightly from the Horse & Plow Restaurant in Wisconsin takes Beer Cheese Soup to a new place. Don’t be fooled: there’s a little heat lurking in this one—it’s fabulous and you’ll love it. The Tabasco and the Worcestershire is an amazing pairing in this delightful winter treasure. It takes a while to prepare this, so have fun—don’t hurry. And when you’re all done and tempted to turn the heat off and let it sit, get your stick blender out and give it a good blending—this will create the very silky, smooth, satin finish. You’ll be amazed. So will your guests. Enjoy this on Christmas Eve or New Year’s Eve, or both. Or just prepare this tomorrow night. 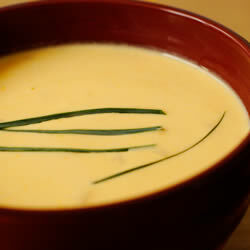 It will be the best beer cheese soup you’ve ever tasted. In a large sauté pan or skillet, melt the butter and add the carrots and onions and sauté until tender, 5 to 7 minutes. When the onions and carrots are soft, make a roux by adding the flour, a pinch each of salt and white pepper and cook over low heat for 10 to 15 minutes. The consistency should be like thick oatmeal. If the mixture is not thick enough, add additional flour. In a large soup pot, heat the milk to almost a boil, but do not let it boil. Reduce the heat and add Tabasco sauce, Worcestershire sauce, chicken broth and the beer. Mix well using a whisk. Add the half and half, the onion powder, the garlic powder, salt and white pepper. Gently heat to almost a boil again, and then slowly add small amounts of the reserved roux to thicken to desired consistency. Cook over medium heat 10 to 15 minutes. Gradually add cheese in small quantities, making sure to thoroughly melt and incorporate each addition before adding more. Cook over low heat for 15 to 20 minutes, serve immediately, garnishing with popped popcorn and or chives. This is important: Do not let the soup reach a temperature over 150 degrees or it will separate. Subscribe to comments with RSS	or TrackBack to 'Three Cheers Beer-Cheese Soup'.